Put the first thing first. When I first got involved in preparedness it became really confusing. I struggled with how to get started and what I should focus on first. I’m really structured in everything that I do but was lost on where to even begin. There are tons of websites and books on the internet relating to preparedness. However, I was unable to find a particular source on how to get started. Like many preppers, I turned to the wide world of webs and prepper forums to find answers only to be left even more confused. When I decided to launch Smart Prepper Gear I began to hear from many preppers who are looking for those same answers. Not only that, but many preppers have become discouraged and defeated due to the lack of answers. Many preppers will tell you that you will not survive if you don’t have this or that. But it’s not really true but another misconception. So last year I decided to write The Strategic Prepper to help those with same challenges that I have been challenged with. I’m nowhere near being a preparedness expert but I have learned a few things along my journey that I believe can be helpful for many. 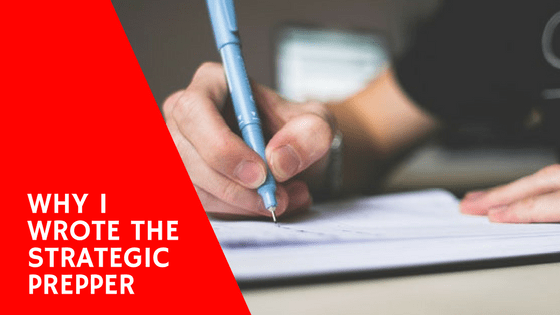 So in this post, I wanted to share my reasons on why I wrote The Strategic Prepper. One thing that I learned quickly is that a lot of the information online is just not realistic. In the mainstream shows like Doomsday Preppers you see people build castles and fortresses to protect themselves. This takes tons of money and resources that a lot of us just don’t have. Then you have other experts who proclaim that you need to pack up and head to a bunker to hide out. They proclaim that the collapse is coming. As of today, the collapse still hasn’t happened. Don’t get me wrong, I believe that a collapse is possible but not as imminent as many dirtbags want you to believe. They just want to sell you their products. To a lot of us average preppers on a budget, a lot of these things are just not realistic. Many of us are stuck in urban environments that leave us at more of a risk for an extreme scenario. We can’t afford just to pack up and leave immediately. Instead, in The Strategic Prepper I talk about how to strategically develop a plan so that you can one day be bug out proof. It doesn’t happen overnight. There are really no sources out there that give a step by step plan on how to get started. Most of our purchases are based on what is trending or what we can afford at the time. As a result of that, many of us are partially prepared in many areas instead of being fully prepared in the important areas. Buying the coolest “tacticool” gear and supplies is nice if you have money to shamelessly spend on these products. Unfortunately, a lot of us live this lifestyle on a budget. We are confined to what we can afford and do. In The Strategic Prepper, I share my story of how I was able to overcome thousands of dollars of debt after being laid off for 2 years. Also, I provide tips on how you can quickly build up your supply on a budget. Our purchases should be strategic and not dependent upon what looks cool or trending. I speak with many preppers every day in person and online. Many tell me their stories of why they are not able to fully prepare the way that they want to. Unfortunate circumstances like a limited amount of money and handicaps hinder many preppers from fully being confident in their lifestyle. The reason that so many preppers are overwhelmed is that of unrealistic expectations and beliefs. Many times, we are so focused on unrealistic or unlikely threats. We become so focused on bugging out during a collapse scenario that we are not fully prepared for more likely scenarios. Again, I’m not saying that a collapse scenario isn’t possible but it isn’t as likely as natural disaster and home invasions, etc. So in The Strategic Prepper, I help preppers conduct a more realistic threat assessment. With this assessment, you are able to prioritize your preps. That way all the money and resources are not spent on less likely scenarios. Altogether, these are my reasons for writing The Strategic Prepper. I hope that is truly helpful to the community. Be sure to check it out at www.smartpreppergear.com/thestrategicprepper. Previous: SPG 014: What is a Strategic Prepper?